If you can zoom in with your computer you'll see 2000 photos! Saw your Birthday Song. Now, I will never forget your voice doing the meow meow song... And what's more amazing is that nice gentleman who sung it with you. Kudos for the teamwork ^^. Erm Katie? Does Glogirly have too much time on her hands? Its called "The Worship of Katie" great work! Purrfectly pawsome. We see you're still out of the "slammer". Did you haf to put up your toys fur bail money? Wow, that is pretty awesome! Now that is interesting. How long did it take Glogirl to put 2000 pictures on there. That is something. Have a great weekend. 2000 photos - are they all yours? Wow! That's amazing! How long did it take you to do this? That's impressive!! Maybe Glogirly needs a job! Just teasing - we're actually jealous be cause she's so creative. That is creative and impressive Katie! Can't think of the artist/photographer but that is exactly like a Van Gogh print that we have...they are so cool. I also have John Lennon one that was done the same way. Wish I could remember the name of who does those. Great job! 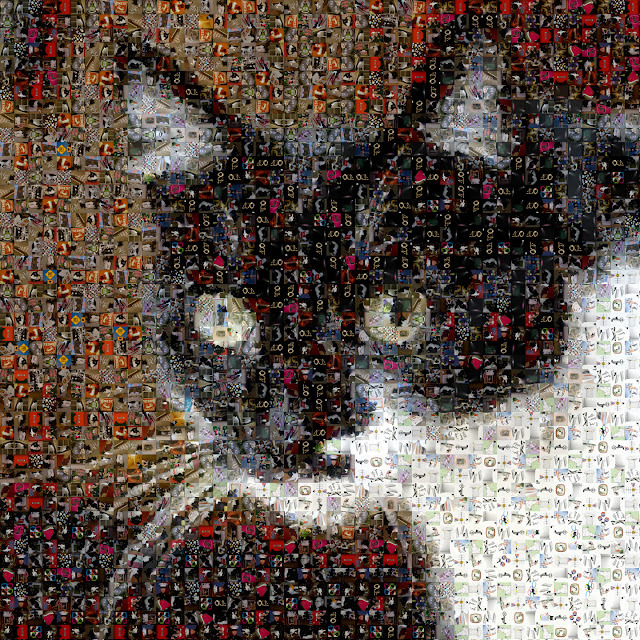 What an awesome mosaic!! Truly the most creative thing I have seen for quite some time. Allie: *giggle* Oh Katie! You're looking quite creative today! So FUN! AndreaMosaic? That's awesome Katie!! I'm guessing that took a lot of work!! Now that's showing some creativity! Pawsome! I remember when the Admiral's creative bother did something like that of her. Katie looks, er, (cough cough) stunning. Just fabulous like you Katie. That photo collage is amazing! Very creative! Glowgirly, you blow me away!